The government is so corrupt. The average American cannot understand why the unemployment rate went down from 9.7% to 9.5%. IF YOU STOP LOOKING FOR WORK YOU ARE NOT PART OF THE STATISTIC ANYMORE. THIS IS INSANITY. Employment-seekers decline by 652,000 June, which may reflect people giving up on job-hunting and a reluctance to hire. Overall, the jobless rate falls to 9.5% from 9.7%, the Labor Department reports. I keep "splaining" this to people so that they can learn and spread the word. Plant the seed like Alex says. looking for work because they believe no jobs are available for them. (CNSNews.com) - The number of Americans whom the U.S. Department of Labor counted as â€œnot in the civilian labor forceâ€� in August hit a record high of 88,921,000. The Labor Department counts a person as not in the civilian labor force if they are at least 16 years old, are not in the military or an institution such as a prison, mental hospital or nursing home, and have not actively looked for a job in the last four weeks. The department counts a person as in â€œthe civilian labor forceâ€� if they are at least 16, are not in the military or an institution such as a prison, mental hospital or nursing home, and either do have a job or have actively looked for one in the last four weeks. 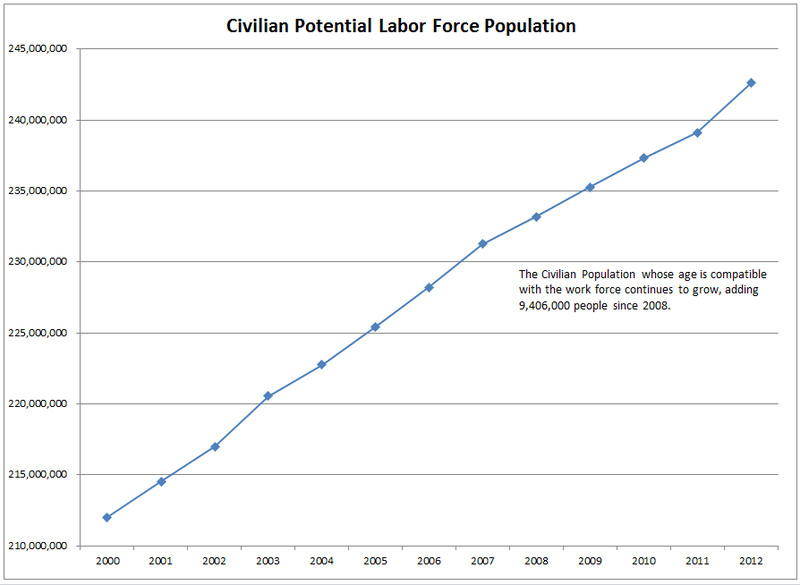 In July, there were 155,013,000 in the U.S. civilian labor force. In August that dropped to 154,645,000â€”meaning that on net 368,000 people simply dropped out of the labor force last month and did not even look for a job. There were also 119,000 fewer Americans employed in August than there were in July. In July, according to the Bureau of Labor Statistics, there were 142,220,000 Americans working. But, in August, there were only 142,101,000 Americans working. Despite the fact that fewer Americans were employed in August than July, the unemployment rate ticked down from 8.3 in July to 8.1. That is because so many people dropped out of the labor force and stopped looking for work. The unemployment rate is the percentage of people in the labor force (meaning they had a job or were actively looking for one) who did not have a job. The Bureau of Labor Statistic also reported that in August the labor force participation rate (the percentage of the people in the civilian non-institutionalized population who either had a job or were actively looking for one) dropped to a 30-year low of 63.5 percent, down from 63.7 percent in July. The last time the labor force participation rate was as low as 63.5 percent was in September 1981. Well, that can be fixed. Just declare the whole country a mental hospital. The worse things get economically, the more the banker-owned political establishment that engineered this mess in the first place will blow sunshine up everyone's backside. "If you're still unemployed or still being foreclosed on, then it's not because of anything criminal bankers and their puppet politicians are doing wrong, but because of something you are doing wrong (or have done wrong)." It's their sick little way of getting the lower and middle class victims of this engineered collapse to blame themselves instead of the ruling class culprits. And blame-the-victim-firsters are only too happy to join in the fun. Yes - A Tavistock specialty - Trauma Based Mind Control - But 88 Million ? I realize that's the number they trot out - but Working age "people" ie plus illegal aliens, I believe that pushes the number to over 100 million. There are 242 million working age Americans. Only 142 million Americans are working - ie 100 million are not in the labor force. There are 242 million working age Americans. Only 142 million Americans are working. That means 100 million working age Americans (41.5%) are not working. Fridayâ€™s report was discouraging throughout. Hourly pay fell, manufacturers cut the most jobs in two years and the number of people in the work force dropped to its lowest level in 31 years. â€œThis weak jobs report is going to feed into (the Fedâ€™s) argument that the economy is growing at a sub-par pace,â€� said John Silvia, chief economist at Wells Fargo. The System doesn't have enough jobs for everyone. But they don't need Jobs anyway, they just need money. And that is only Virtual. TPTB love percentages since it abscures the physical numbers. The growth in government jobs is not sustainable nor is there any genuine excuse for it other than political pandering and vote-buying operations. The deviance between [Gov. 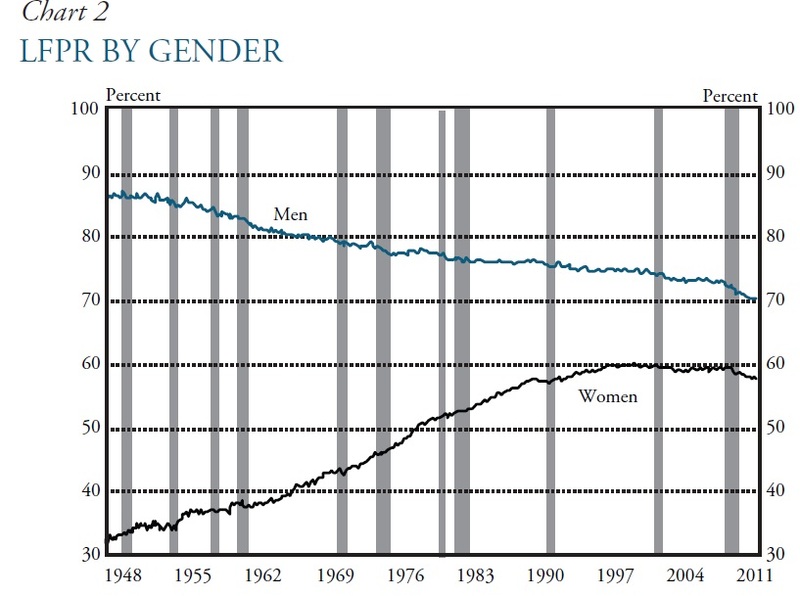 and] private jobs and population growth is easily explained by the entry of women in the workforce. I think this abscures the numbers too - 5 million "labor force needed" ? Give me a break! who writes this stuff? Yeah women get all the government and banker jobs cuz women will be more compliant in the corporate world. It is natural for women to seek masculine approval when there is money involved. Plus women don't make political connections to a lot of things so they can be easily manipulated. This is why even Hitler knew that to insure fascism get the women to run things. I know women who work for banks who have no idea about the NWO or the impending economic collapse. I am not saying all women, many women on Prisonplanet and Coast-to-Coast are well informed, I am talking just your average American woman who doesn't follow politics. 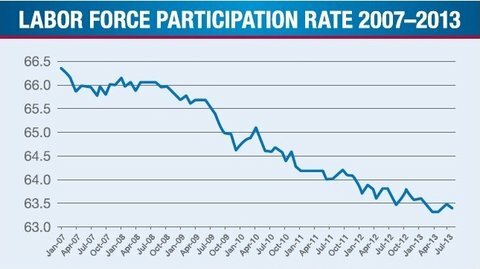 The percentage of Americans who have a job or are looking for one, known as the labor force participation rate (LFPR), has plunged to a 34-year low, according to a new report from staffing company Express Employment Professionals. "Following the Great Recession, we've entered into the Great Shift," says Express Employment Professionals CEO Bob Funk, who previously served as chairman of the Kansas City Federal Reserve Bank. "This is a period defined by the Boomer retirement, Millennial frustration, and growing reliance on government programs. All indicators suggest this shift is not sustainable." The New York Times reported on the study and suggested that "another cause [of the Great Shift] may be the rise in the number of workers on disability." A record 8,733,461 people now receive disability benefits, a figure greater than the population of New York City. Today, nearly 90 million Americans are no longer in the labor force. The System doesn't have enough jobs for everyone. Good luck explaining that to a blame-the-victim-firster. But they don't need Jobs anyway, they just need money. And that is only Virtual. Wait until technological unemployment ramps up. This, coupled with polluting the food supply, is how evil covertly controls population. (CNSNews.com) - The number of Americans who are 16 years or older and who have decided not to participate in the nation's labor force has climbed to a record 90,609,000 in September, according to data released today by the Bureau of Labor Statistics. The BLS counts a person as participating in the labor force if they are 16 years or older and either have a job or have actively sought a job in the last four weeks. A person is not participating in the labor force if they are 16 or older and have not sought a job in the last four weeks. In from July to August, according to BLS, Americans not participating in the labor force climbed from 89,957,000 to 90,473,000, pushing past 90,000,000 for the first time, with a one month increase of 516,000. In September, it climbed again to 90,609,000, an increase of 136,000 during the month. In January 2009, when President Barack Obama took office, there were 80,507,000 Americans not in the labor force. Thus, the number of Americans not in the labor force has increased by 10,102,000 during Obama's presidency. AKA Republicans and other contards !!!! I think you're on the wrong website. On Friday, the Labor Department reported that 720,000 Americans left the labor force. This exodus pushed the labor force participation rate down to 62.8%, the lowest level since 1978. One out of three adults is neither working nor actively looking for work. In spite of the gain in jobs, the overall number of Americans with a job fell by 735,000, to less than 144 million. Just 58.3% of adults were employed in October. The labor force participation rate is the percentage of people over 16 in the non-institutionalized population who either have a job or actively sought one in the last four weeks. "There are currently 61.1 million American men in their prime working years, age 25â€“54. A staggering 1 in 8 such men are not in the labor force at all, meaning they are neither working nor looking for work. This is an all-time high dating back to when records were first kept in 1955. 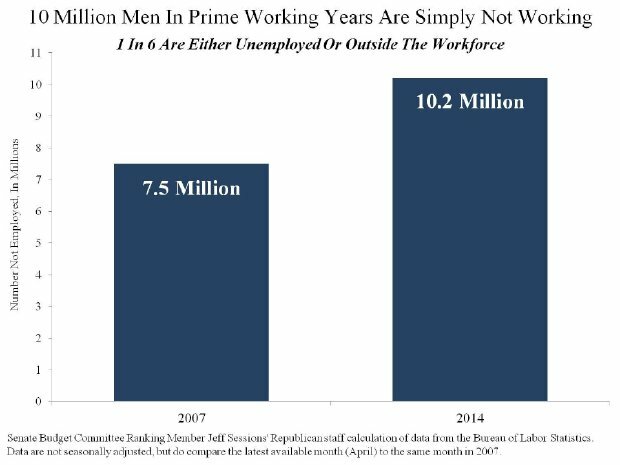 An additional 2.9 million men are in the labor force but not employed (i.e., they would work if they could find a job). A total of 10.2 million individuals in this cohort, therefore, are not holding jobs in the U.S. economy today. There are also nearly 3 million more men in this age group not working today than there were before the recession began," the Republicans on the Senate Budget Committee claim. 'The ratio of those over 55 in the workforce actually ticked up'â€”in other words, older Americans are being forced to return to work in a poor economy to make ends meet while many younger Americans simply arenâ€™t working at all. In short, there is an unprecedented supply of working-age Americans who do not hold jobs." Easy way to destroy a Nation---keep young men unemployed---this leads to massive crime and a decline in morals as the Nation disintegrates. This is a time tested method of The New World Order; as they destroy the planet: Nation by Nation. NO JOBS = NO FOOD/or/shelter/or anything/which equals DEATH! In other words, a little over 101 million Americans are unemployed or out of the labor force. Still, if only looking at this metric, the Fed would likely have no choice but to proceed with a rate hike in the first half of 2015. Why are people leaving the workforce? But one part of that picture is still a puzzle: People continue to stop looking for work, and in doing so, are dropping out of the labor pool. 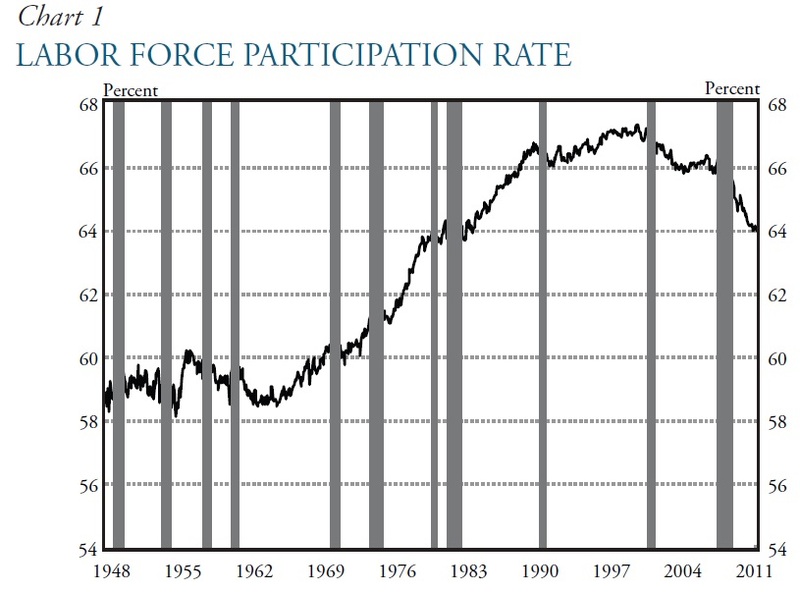 In fact, the participation rate in the labor force has fallen to 62.7 percent -- its lowest level since early 1978. How can this be? As the job market heats up and the unemployment rate falls, wouldn't that mean more people are looking for work, not less? "The decline is without precedent," Bob Funk, chief executive of global staffing company Express Employment Professionals, told CBS MoneyWatch. Government tracking of employment statistics go back to 1948, he said, "and a decline like this has never happened since then." There's no clear reason why people are leaving the workforce, and the issue has ignited a fierce debate among economists. One trend that they seem to agree on? About half of the decline is due to baby boomers entering their retirement years. Another end of America story. The only way a lot of people can make it today is to come up with their own brainy ideas just like Gerald Celente has always been saying. I have a friend that was working in a hardware store for $11 per hour. With kids he couldn't make it so he started his own Mr Fix It- type of business. Now he earns $25 to $50 an hour---a lot of it under the table. America has well over $250 trillion in unfunded liabilities that come due in the next 30 to 40 years. AMERICA CAN ONLY PAY FOR THESE LIABILITIES IN FIAT MONEY. "Can't be like the rest"
There will be another war, getting all the young ones in the boots. Oby doubles up on troops sent to Iraq.. This was inevitable, planned. Do the citizens truly beleive our Gov/Regime can invade these nations , end the MIC profits, stop the syndicate, and walk away. For muck sake the grand leader of ISIS was in custody for years and cut him loose free as a birdy-------- , prepped..
War in for the long haul... Wait till the GOP's get their hands on this, they make no bones about imploding the wars.. DEMS-GOP... DemiGodps. I personally feel like a dirty shiksa when working for the legal tender. Pay me gold or silver. Freaky frn s are nasty. I know I've said this before...people are used to the cages they live in and they'll defend their cages. What's life outside of the cage? What's the majority of answers I'd get? "Idk, man, maybe you're nuts for suggesting life/our world could be better outside of our individual cages?" or "What are you talking about? I'm not in a cage!" I recently went to FMI for a little work doing welding. They effing pay in Jew Dough and pull money (copper, Silver and Gold) out of the ground and pay in Jew Dough. Oh, the madness!! (Reuters) - Arizona Governor Jan Brewer vetoed a measure on Thursday that would have made gold and silver legal tender in the state, saying the legislation could have resulted in lost tax revenue. The Republican-controlled state legislature voted through the measure last month in a response to what backers said was a lack of confidence in the international monetary system. 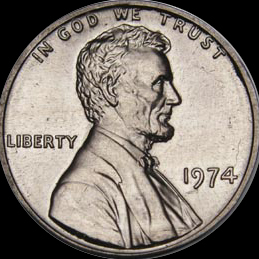 The bill called for Arizona to make gold and silver coins and bullion legal tender beginning in mid-2014, joining existing U.S. currency issued by the federal government. "While I believe the concern over a devalued dollar as a result of an unsustainable federal deficit is justified, I am unable to support this legislation," Brewer, a Republican, said in an open letter to state Senate President Andy Biggs. Brewer noted that the "administrative and fiscal burdens" for taxpayers and the revenue department "remain vague." She also cited uncertainty over whether the legislation would have required the state to exempt transactions involving collectable coins and bills that were authorized by Congress and could be used as legal tender. "This would result in lost revenue to the state, while giving businesses that buy and sell collectable coins or currency originally authorized by Congress an unfair tax advantage," she said. The push to establish gold and silver as currency has become increasingly popular in the United States in recent years among some hardline fiscal conservatives, with the backing of groups including the Tea Party movement, American Principles Project and the Gold Standard Institute. Gold, silver, copper, along with a multide of others to barter with, just may be a tactic of survival. Run your falg up a pole, hail the cheif duriing the day only. I watched this from of victroy long ago. They play a game, so can we. Donnow what the ThePlanet server is but I do post here on Forum Prison Planet under Letsbereal http://forum.prisonplanet.com/index.php?board=198.0 (scroll down past the fat printed stickies) 7474 Posts in the Financial section of this forum. Planning my own site(s) later. Following last month's total collapse in the participation rate, dropping to 36 year lows, this month there was a modest improvement in the composition of the labor force, with the Household Survey suggesting the ranks of the Employed rose by 683K people, while the Unemployed actually declined by 267K, leading to a drop of the people not in the labor force to 92.378MM from 92.584MM. In other words, a little over 101 million Americans are unemployed or out of the labor force. Still, if only looking at this metric, the Fed would likely have no choice but to proceed with a rate hike in the first half of 2015. MSM tells us the jobless rate is a 5.8% low.. Yes but we know that if people QUIT LOOKING FOR WORK, THEY ARE NOT COUNTED IN THE NUMBERS AND PERCENTAGES. The governments old trick of SMOKE AND MIRRORS. Lower Participation = Lower Unemployment Rate. As high as the unemployment numbers are, they still overstate the economyâ€™s performance. Since the recession began, the labor force participation rateâ€”the proportion of adults either working or trying to find workâ€”has fallen by 3.2 percentage points. The government counts only people actively looking for jobs as unemployed. The drop in labor force participation accounts for almost the entire net drop in the unemployment rate over the past five years. Another measure of the state of the labor market is the employmentâ€“population ratio. 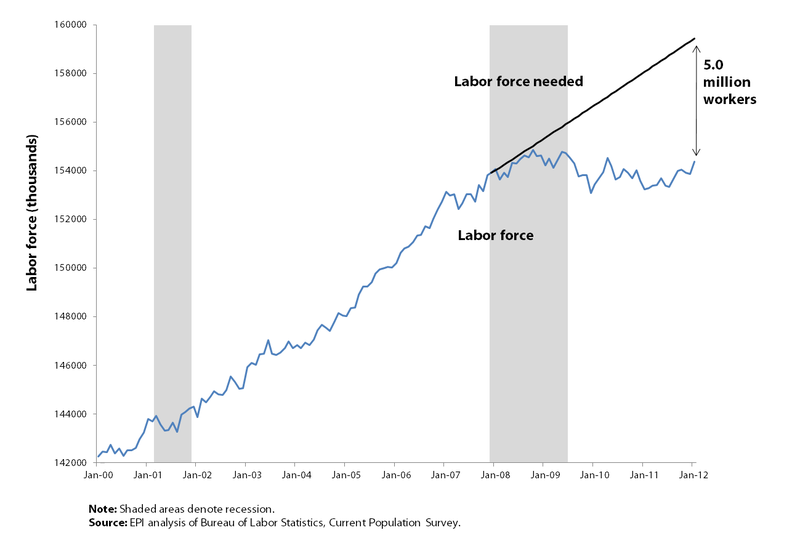 This ratio shows employees as a proportion of all adults, both those looking for work and those outside the labor force. During the recession, the employmentâ€“population ratio fell sharply and the unemployment rate increased. Since then, the unemployment rate has improved modestly. The employmentâ€“population ratio barely increased. This place blew up last night.
. This place supplies the gold copper and silver for us. It blows . Coincidence? I was there a couple weeks past welding right over that spot.my supervisor and close friend is a OKC trutherWTF? (CNSNews.com) - The number of Americans not in the labor force last month totaled 94,513,000 -- a slight improvement from the 94,610,000 not in the labor force in September--but the labor force participation rate nonetheless remained at its lowest point in 38 years, with only 62.4 percent of the civilian noninstitutional population either holding a job or actively seeking one. The Bureau of Labor Statistics says economy added 271,000 jobs in October, well above economists' expectations of 185,000, and the unemployment rate dropped to 5.0 percent in October from September's 5.1 percent. This is exactly what we have been expecting to happen. On Friday, the Bureau of Labor Statistics announced that the U.S. economy only added 38,000 jobs in May. This was way below the 158,000 jobs that analysts were projecting, and it is also way below what is needed just to keep up with population growth. In addition, the number of jobs created in April was revised down by 37,000 and the number of jobs created in March was revised down by 22,000. This was the worst jobs report in almost six years, and the consensus on Wall Street is that it was an unmitigated disaster. The funny thing is that the Obama administration says that the unemployment rate actually went down last month. 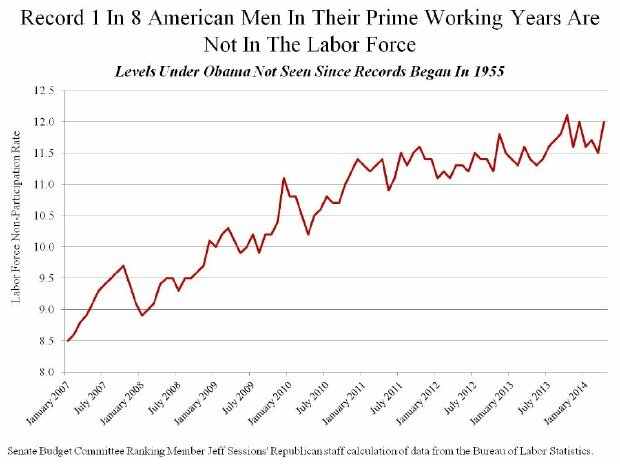 Almost every month since Obama has been in the White House, large numbers of Americans that have been unemployed for a very long time are shifted from the â€œunemploymentâ€� category to the â€œnot in the labor forceâ€� category. This has resulted in a steadily falling â€œunemployment rateâ€� even though the percentage of the population that is actually working has not changed very much at all since the depths of the last recession. The Bureau of Labor Statistics claims that the number of Americans â€œnot in the labor forceâ€� increased by 664,000 from April to May. If you believe that, I have a giant bridge on the west coast that I would like to sell you. The labor force participation rate is now down to 62.6, and it is hovering just above a 38 year low. When you add the number of working age Americans that are â€œofficially unemployedâ€� (7.4 million) to the number of working age Americans that are considered to be â€œnot in the labor forceâ€� (an all-time record high of 94.7 million), you get a grand total of 102.1 million working age Americans that do not have a job right now. So far in 2016, three members of my own extended family have lost their jobs. That is really useful post.Thanks a lot for sharing it. 94,446,000 ~ 95 Millon Americans NOT In Work Force!